The Shooting Script features behind-the-scenes with the filmmakers. Join the Corner Bloc for that 20% discount. Need a look inside? Preview the book. It looks good. 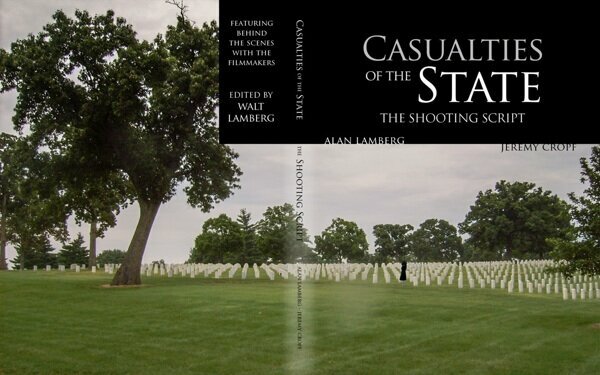 We get double the royalty if you buy it on CreateSpace rather than Amazon. The novel adaption differs from the movie in that there is more character development and the story centers around Jonathan Seeger, an FBI agent on the verge of retirement. Preview the first pages. Co-written with author Walt Lamberg, a veteran who published a series of short stories For the Good Guys in the Army. Download or stream at Gumroad Distribution. Need a glimpse? Watch the trailer. For a 20% discount for the movie, shooting script book, free e-novel and more, first Join the Corner Bloc. Join the Conversation with the director and the writer: post comments in our Facebook photo album; each photo represents a topic of discussion in the book. Meme Contest: Make a meme that helps publicize our film. Winner gets $50 Amazon.com gift card. Download media for your mobile devices, desktop and more: Posters, Desktop Wallpaper, Storyboards, Cinematic Frames, and Photos. Interviews are indexed by date. Selected Auditions of principal cast members. Listen to the Cinematic Score by Patrick Cannell. Read Anecdotes & Essays by Alan Lamberg.